That isn't a pile of ramen noodles, it's yarn! 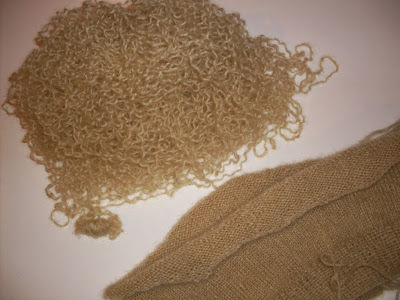 I had just finished all the decreases at the waist of the Soft Kid Bubble tunic when I looked at what I had knit and decided I didn't like it. There wasn't any specific reason, just that I don't think I would have worn a knitted tunic that often. So, I decided to frog all my knitting and start something new. I'm looking at another project from the Rowan Studio book (it has the Balloon Sleeve Top pattern I recently made). It's full of projects made with mohair and mohair blend yarns, which is exactly what this is. Perfect!